Also it sure would have been nice to be able to open the rear hatch from the inside. I pulled into a $6 per night RV park in Oklahoma in my CRX. I pulled out the cover on the inside back of the CRX, so I could reach the linkage, and open the hatch. Sometime during the night a ferocious wind storm blew in, and I was instantly jolted wide awake when, in my sleep, I unconsciously pulled the linkage, and my hatch violently snapped open! You might want to guard against that. I use a Wagan 24L, not large. It only draws 3.5 amps, and it only cools something like 30 degrees F below ambient. You should slap some R-10 pink foam all the way around it from Home Depot and see if it will go lower. I really think this would be a sweet way travel cheap and not have to pay rent when traveling and working in areas for short periods of time. Brainstorming moving to an area like Dallas after college, and trying not to spend $2000 grand a month on renting housing and thought this would be a fun and quirky little way to live and travel. Avoiding high overhead isn’t that hard, it’s that one becomes yet MORE dependent on a vehicle. It continues the trend of city destruction and suburban sprawl underway since the late 1960s. For the pair of centuries preceding, one rented a room from a family or, later, at a boardinghouse. Drugs ruined boardinghouses. Call that 1971. Men becoming violent on alcohol was one thing, but drugs another entirely (and; gee, when did we close mental institutions; voila, same exact era). And the ethnic neighborhoods were busted up by a variety of schemes to enact just that. The place we’d have gone to rent a room from a congregation member. And walk the city. Now we’ve added debt via “education” (really, sloppy indoctrination) and artificially-high housing prices. And absolute dependence on cars. Not optional for forty years or more. Plus, all the remaining decent jobs have disappeared to a handful of cities. The de-population of the countryside continues. How’s a young man supposed to form a family? I’m at the other end. Children grown and parents deceased. Wife broomsticked away. The quaint notion of “retirement” still appeals. So a high cost fixed overhead is unattractive. An answer for me has been an aircraft-quality, all-aluminum, fully aerodynamic travel trailer. An indefinite lifespan. I can move where I want WHEN I want (no lease), and while outside the boundaries of town (meaning longer commute) the individual private vehicle need not be a pickup truck. But it won’t be a Prius either. Somewhere in between. One does have to be willing to learn to maintain, repair & upgrade. (There are few things in life as satisfying as these), so that seemingly formidable aspect is a win-win. There’s no substitute for warm & dry. And then, hot water. No passenger vehicle large enough is ever really a substitute as it’s primary function of transportation is burdened by higher than necessary operating costs. What I checked off above is “the war”. Understanding that it is so, is the first step. An American high school graduate circa 1960 could find work adequate to making a marriage proposal as sole provider contingent also on the affordable housing of the era. What has happened since isn’t due to, “impersonal global forces”, or other such claptrap. How to look upon future prospects is NOT to count on debt forgiveness or asset bubble punctures, but being able leverage tools with a lifetime or half a lifetime of use (50 or 25 years, say). In my opinion. What money I may have needs to cover more than making others yet richer than they are. I’ll cut this short by saying the vehicles in my sig were chosen this way. Longevity, reliability & low cost of ownership were paramount (today I wouldn’t buy a pickup; had an applicable business way back when). A quarter-century use of them (they need to fully operational at sale) drives what plan there is. That I’m third generation in this made it easier (travel trailer type; a lifetime of acquaintance). But I ALWAYS have a home. (The details of “ground rent” are another subject). That (a house) should be what drives investment of time. If one says, “well, I can always live with a relative or friend”, consider that this may not be possible. In fact, they are looking to you. A young unmarried man is expendable, per se. He is also the only one who can stand up to the rigors of war. It’s a two-edged sword. Be other than the 22% of twenty-something men foregoing work altogether in order to sponge off their parents (playing video games) with no acquisition of skills or developing sense of responsibility as counterweight. Not half steps (“hmm, live out of car”). Outside of Special Forces, the US military has been turned into a giant welfare scam. But even that would be FAR better than a crap job with no future when even basic living expenses are prohibitive. The taxpayer revenue stream has been the only source of “profit” for an eon. (Public jobs expansion since 1960, and “privatization”; past War Department budgets). But as white men are the sole demographic to generate a tax surplus before leaving this life, that, too, is on the way out. Your mind is the whetstone. Last edited by slowmover; 12-19-2018 at 10:07 AM.. Without getting too in-depth on conversations, man you aren't wrong. I had a long reply typed out, but I can probably just sum it up with people my age are taught convenience is above all, keeping up with the Jones' with someone else's money is cool, and dependency is normal. I'm afraid of most women for that reason lol. Back to car talk: I have a 2010 Prius and a 1996 Ford Ranger for that exact reason with maybe 5100$ invested between the two. They are both extremely reliable and cheap to fix. (yes even the Prius...). The Prius has been knocked around a little with other people's cars, but I have just been fixing it myself and putting the insurance check towards the note. I think the American dream isn't totally in the ****ter though. People just go about it wrong these days. Airbnb is a good way to travel. I Airbnb one of my bedrooms this summer, and besides dealing with SJWs or older folks who expect too much from the cheapest room on Airbnb it has been a great experience. I lived in my Subaru Legacy for almost 2 years. My job had me doing 13hr days for half a week, and I couldn't see myself paying rent just to sleep. I'd pack my clothes for the week, work my 13hr shift and then grab dinner from the McDonalds $1 menu. Then I'd head to a nearby abandoned hardware store parking lot. They had cut the power to the street lamps so it was nice and dark. I'd brush my teeth and listen to the radio briefly before putting the rear seats down and crawling into my sleeping bag. I left my car doors unlocked because I'd rather not have smashed windows, and I could more easily tackle anyone trying to enter that way. Never had an issue. Police would ask what I'm doing about once every 2 months. I'd just say that I'm sleeping on private property, and they'd leave. In the morning I would get a workout and shower at my 24HR gym, which I pay $8/mo for. KCF used to have full meals for $3, and Safeway used to have JoJos, a corndog, and a pop for $2. Not sure what the cheapest quick food options are these days, but the McDonalds app has deals. I had a medium fry and McDouble for $2 yesterday. I lived in my Subaru Legacy for almost 2 years. But without energy cost rice is about 2c per cup. Needless to say once I figured this out I eat a lot of rice. Mom gave me an expensive rice cooker. I'll calculate the electricity cost to do a 40min cook. I imagine cooking rice doesn't take much more energy to do a larger batch, so you could just cook more at a time and store the leftovers. I was able to save 90% of my paycheck back in those days. Car was paid off, work provided my cell phone. My only expenses were gasoline, food, $8/mo gym membership... I'd stay at my parent's on my days off and do laundry. This allowed me to save up enough to buy a house in 2010, get roommates which offset the mortgage cost, and continue saving. I paid cash for a wedding, wife's CC debt, student loans, 2 years of a medical program, and have a lot saved up now after having our first baby. I don't budget. Budgeting is for people who aren't naturally frugal (dislike spending money). Spenders need a budget. Last edited by redpoint5; 12-19-2018 at 05:15 PM..
We camped around "living out of our car" and sleeping in a tent on several occasions during the last couple of years simply so we could save on hotels in both our Nissan Leaf and now our Toyota Avalon. We just carry around a cook stove for cooking. From time to time camp at a paid campground that has showers. I've thought of getting an insulated tent like one made by Crua, but don't know it would be worth the hassel in the winter when hotels are much cheaper in some areas during that time of year. For now though we don't plan on moving out of our actual home. We just travel a lot is all. I do know someone who took his wife and kid and moved into a four season fifth wheel (camping trailer.) Rent around here has nearly doubled in the past couple of years for most people. And the price of land is outrageous. Apparently prices are going up everywhere. Another option is if you find a job that offers healthcare for the whole family that will help reduce health care costs by quite a bit (but not eliminate the out-of-pocket expenses of course.) One person would still have to make about $25 an hour to pay for the rest, which is still more than average. Or both parents have to work making at the very very least $12.5 an hour. And that's only if the own one car together and don't pay for any other transportation. Hopefully they work at the same place or make more money to pay for more transportation costs. But if you don't make much and still want to have things like healthcare and can't get on Wellfare for some reason, then the next biggest expense is housing. So living out of our cars can seem appealing. Or like my friend did and get in a travel trailer, put your family in it and move it every 14 days some 20 miles so he's ok with the forest rangers. I just remembered my father's camper. That's it behind my first car. 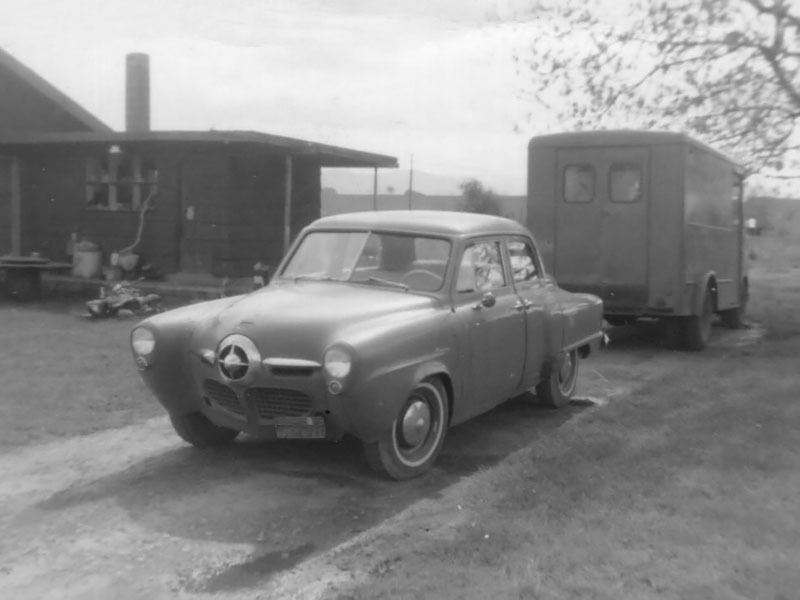 It was a 1948 Chevrolet Sunbeam Bread delivery truck. He painted it Oxide red and bolted the rear doors shut. It had double bunks across the back and a cabinet down the driver side that had a sink (fed from a 5-gallon milk can stood in the footwell) and a recess for a Coleman stove. And a Buick AM radio bolted to the ceiling. With some generic commercial signage for urban camouflage it would make a tolerable low-key rolling home. It definitely wasn't an Interstate cruiser. Lots of quotes I agree with here, and I love the topic. Outside of Special Forces, the US military has been turned into a giant welfare scam. I'm glad I'm not the only one who notices. I have one acquaintance who is pulling down $1800/mo from the military, for life, for vague health complaints like a sore back. He wasn't even in combat, he worked a desk job. Awesome! Save 90% for a few years and you're set. I don't think the American dream is dead, either. You just have to work relatively hard and always look for opportunities to improve your situation. For example, a lot of people pay $100/mo for cell service. A tiny bit of shopping will get that down to $50/mo.